There are very few battleship games for free nowadays and World of Warships is one of the best currently available. This naval MMO was created by Lesta Studio and Wargaming then released in 2015 as a free-ro-play game. able to modify ships to suit their playstyle which adds a new level of strategy to the game. However, this does come with a downside. There are strong elements of pay-to-win through the customization system as it’s possible to purchase upgrades with real money. Players can also purchase new ships with real money. As a result, players can quickly progress through the game without needing play lots of games to earn the in-game currency. The game has two main game types for players to select between. The co-op mode allows a group of players to work together against the AI in a team deathmatch style mode. While the PvP mode has players battle it out in 12v12 combat which has a specific victory objective to complete. It’s always nice to see an MMO action game with an AI option for more casual players and in World of Warships, the co-op mode is very similar to the PvP mode. It results in a nice alternative for players who are looking for a more casual game. While this multiplayer war game at some point lacks game modes, it makes up for this with a large number of maps. Each map has a different geographical layout which makes them feel unique to battle in. The two teams spawn on either side of the map and each one is relatively open. Despite having open maps, spotting enemies can be a difficult thing to do as each map is filled with terrain to hide behind. In addition to this, predicting a ship’s trajectory is rather easy and after a few games, all players have gotten the hang of the firing systems allowing them to avoid attacks. Combat in the game is very simple. Players need to predict the enemies movement and attack where they think the ship will be. The combat is all about prediction and stealth which comes from hiding in the terrain. It’s possible to fight and travel through open water but this isn’t recommended. Once a ship builds momentum, it becomes very difficult to turn which makes them an easy target for enemy players. Ships moving at a high speed are very predictable as a result. Combat may be the main focus of this game but it’s also worth mentioning the amazing graphics of the world. The game looks and sounds amazing which easily make this game stand out from the naval combat genre. 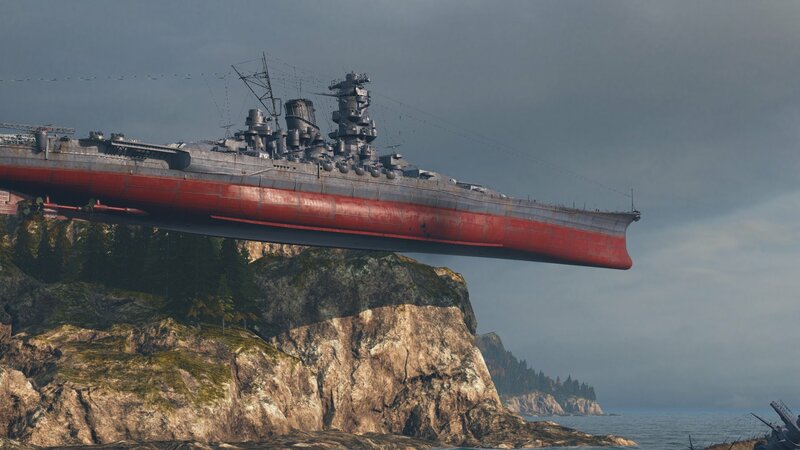 World of Warships is a stunning MMO online battleship game. The gameplay is incredibly smooth yet highly strategic and tense. The combat in the game is somewhat slow but that doesn’t do anything to remove the incredibly tense moments from the game. Having a co-op mode is also great to see as many MMO action games lack this feature. The only real downside is that gameplay could become a little repetitive or tedious after a few hours of play however due to the lack of other game modes, but not for real multiplayer war games fans. Despite this, World of Warships is a solid MMO action game which everyone should try at least once. So go ahead and give it a try if you are ready to spend some massive time in a real online battleship.